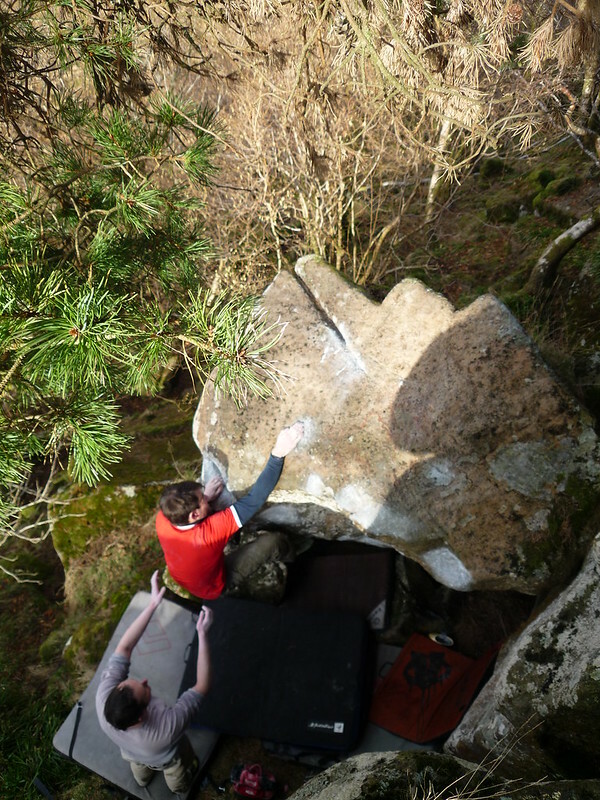 Well it all looks spanking new and freshly minted rock as it first was... and the lads are doing a good job to be careful with holds and 'historical' graffiti after advice from climbers. 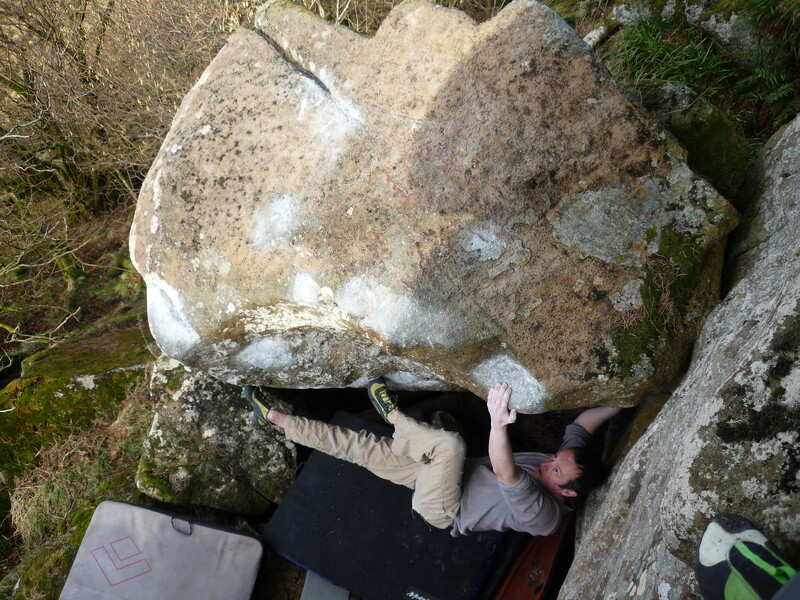 As for the climbing I think there may be a short window while it feels grittier, but no doubt shoe resin and chalk and weather, and budding Banksies, will see it back to good ol' Dumby glass. 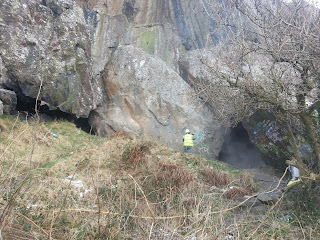 Remember no climbing this week until after 5pm to let the guys finish their work. Toto at Dumby from John Watson on Vimeo. 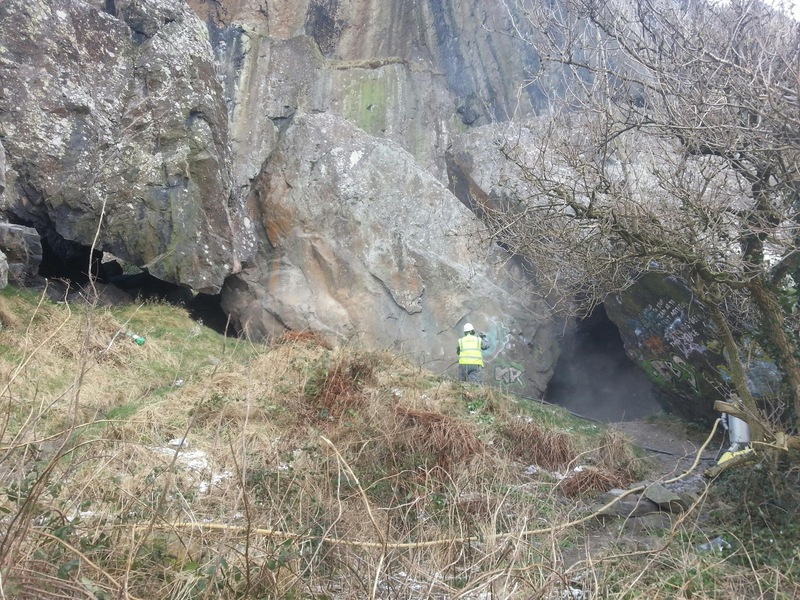 Just to let everyone know that Historic Scotland, who own the boulders and crag at Dumbarton Rock, have agreed to clean the boulders of graffiti, overseen by climbers so no holds are damaged. After excellent concern for our sporting heritage and good consultancy (thanks to Ian Lambie of Historic Scotland and Andrea Partridge at the MCOS! ), I'll be attending the first day of cleaning on Monday 11th March. 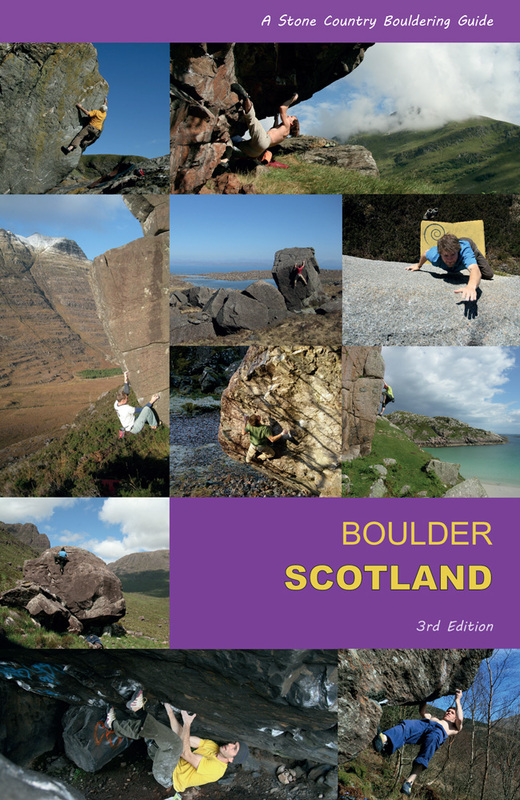 I would like to ask climbers and boulderers to avoid climbing here in this period while the cleaning goes on, as for safety reasons parts of the crag and boulders will have to be cordoned off. I would ask all to respect the arrangements we've made on behalf of climbers, as much good work has gone on in the background to arrange the best form of cleaning and restoration. Unfortunately much of the 'historic' graffiti has vanished behind modern graffiti, so it's impossible to restore the lower 'layers' - it will all just have to come off. 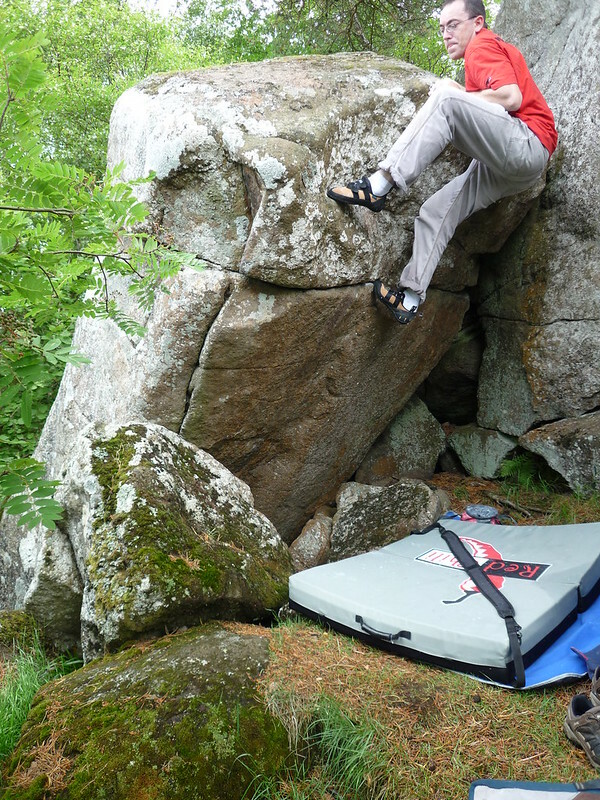 The boulders at Craigmore are tiny, the crag routes only a few metres. It is a place for locals only, for top-roping, not meant to be seen as anything other than diversionary. Travelling rock-rats shrug and do a couple of the over-starred routes on top-route, maybe pull a few of the more obvious problems and leave, thinking it a heap of dank green esoterica best left to, yes, you guessed it - the locals. That's all fine with me and I'm not going to praise it to the skies and rate it as Scotland's last hidden secret - it's not. It's a north-facing crag. That usually keeps the crowds away. Everything bad about it is obvious on arrival, mostly: it's boggy, muddy, vegetated, slimy, midgy, repetitive, confusing, dark, chilly, always condition-dependent. Most happily affirm it is deservedly forgotten and overshadowed by its big neighbour at Dumbarton. But I love forgotten places and I go there to get away from it all, or climb with a few friends who have put the same time in here. It's not always the big, shiny things that are valuable. I've sat under the last pine tree at Jamie's Overhang for hundreds of hours over the years: waiting for the rock to dry; or just catching the last rays as the sun dips west in the afternoon; or blankly staring at the wind in the leaves; or looking at the pinkness of my tips, peeling off little chalky flaps of skin. I know the dimpled nature of every hand-hold, the failure-pressures of tiny foot slopers, the windows of core-tension and when they're needed; the secret tricks of linking no more than four metres of rock. It's as intricate as a Rubik-cube and I twist it round and round, mixing up its endless sequence of colours. Clouds scud past in stop-motion. I'm not in the slightest hurry to solve it, nor am I aware of any solution other than just doing this. What would you be trying to solve? 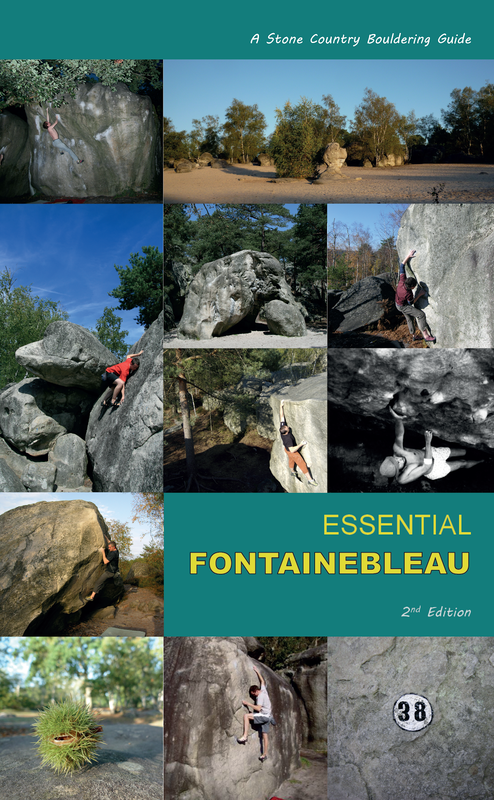 I've done every conceivable eliminate on this little leaning bloc, on its 12 holds, mixing and matching to my own satisfaction and moving in circles, always absorbed, never fretting about concretions such as 'lines' or 'summits', the 'sends' are irrelevant as I've repeated them so many times. It is a repetition of simple knowing. Craigmore in a dry, crisp spell, under the pines, is as meaningful to me as the alpinist's glimpse of an iced-up north face, or the trad-junkie's gaze on a 100m rock wall. This just happens to be a pine-needle-covered lump of leaning basalt a few miles north of where I live, in a quiet corner of a crag under a pine tree. It has a wide but modest vista of the Southern Highlands. I couldn't give a fig if people thought it an insignificant piece of mossy rock. In fact, I'd much rather they thought that.